Guys, when you get this email I’ll be on a Disney cruise! But I didn’t forget you, I also added a few recipes for Valentine’s Day this week. I plan on taking my own advice on avoiding weight gain on a cruise. Of course, I do plan on indulging and that’s ok too because I know how to get back on track once I am home. 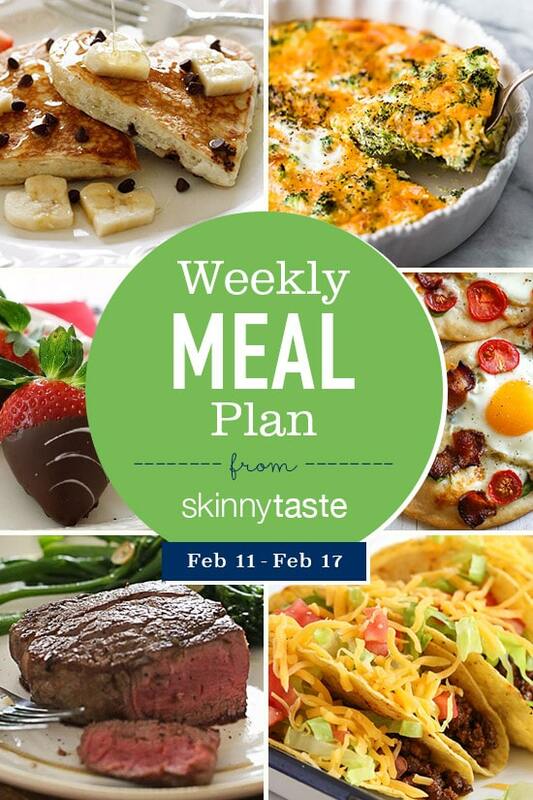 And if you’re new to my meal plans, I’ve been sharing these free, 7-day flexible healthy meal plans (you can see my previous meal plans here) that are meant as a guide, with plenty of wiggle room for you to add more food, coffee, beverages, fruits, snacks, dessert, wine, etc or swap recipes out for meals you prefer, you can search for recipes by course in the index. You should aim for around 1500 calories* per day. **Boil an extra egg for Friday lunch. ½ cup each: cucumber, carrots, tomatoes. Wake up and Eat Clean with these Peanut Butter Banana Overnight No-Oats!